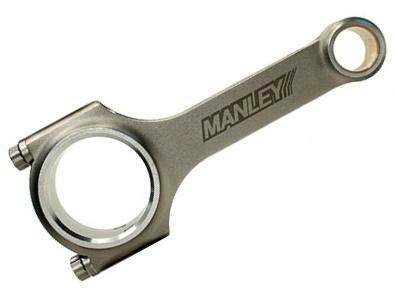 Manley Performance manufactures the finest steel connecting rods in the Sport Compact industry. Our Pro Series “I” Beam is forged from 4340 aircraft quality vacuum degassed material. We utilize our proven “Turbo Tuff” design and add 3/8” ARP 2000 cap screws. All rods are properly shot peened after machining and 100% magnafluxed. For the budget conscious enthusiast, we also offer our very high quality, yet economical, H-Beam design connecting rods. These are also manufactured from 4340 alloy forgings. They are fully machined, heat treated, stress relieved, shot peened, and magnafluxed. They also are built standard with 3/8” ARP 2000 bolts. All Manley connecting rod sets, are weight matched to ± 1.5 grams, big and small end bores are final honed to a tolerance of ± .0002”, critical bend and twist attributes are held to a minimum, and exacting attention is paid to every detail by our final inspection department; thus rendering a finished product that is second to none.